After not quilting for so long, I’ve got ideas and things I want to do/make and not enough time. First up, Project Warm Embrace Dream Bags. Let me back up a moment. 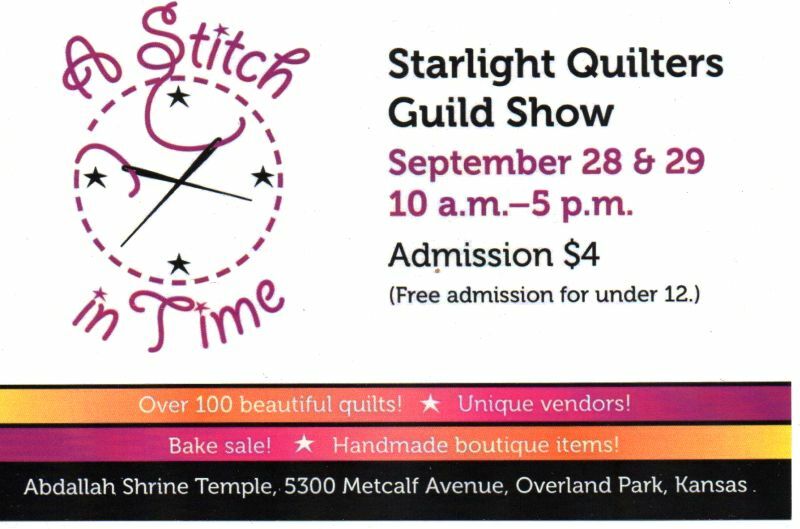 Back in June I joined Starlight Quilter Guild. 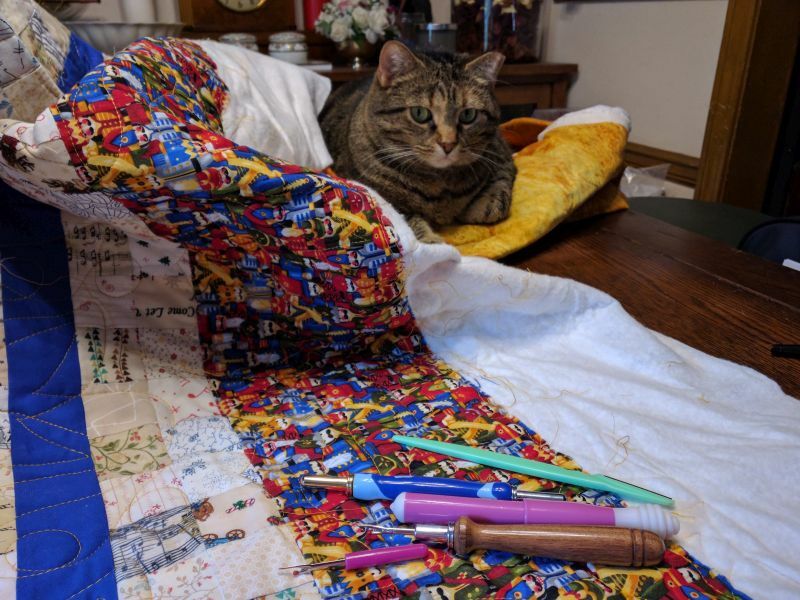 They make quilts for both Project Linus and Project Warm Embrace. Additionally, the Group Project this year is the Dream Bags. They are pillowcases with drawstrings given to foster kids so when they are moved they have something to put their possessions in other than a trash bag. Yesterday, I cut kits so I have something quick to finish. Also pictured are upholstery samples cut to size and kitted up with zippers to make zipper bags. These will go into the Guild Boutique at the Quilt show in September. I have fabric for more bags, but I need to get more zippers. While I haven’t finished the quilt top from pastel shirts yet, since I’m going to use the cowboy fabric, I need to make it smaller. 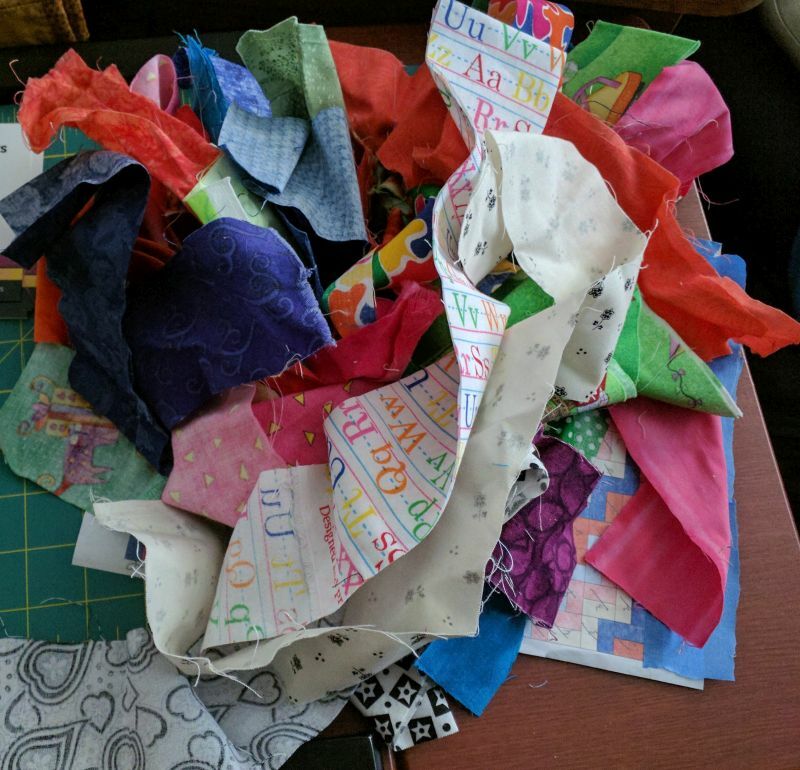 So, I’m going to make a smaller quilt with the leftover blocks and the rest of the fabric from the shirts. But I really wanted to make a larger quilt. 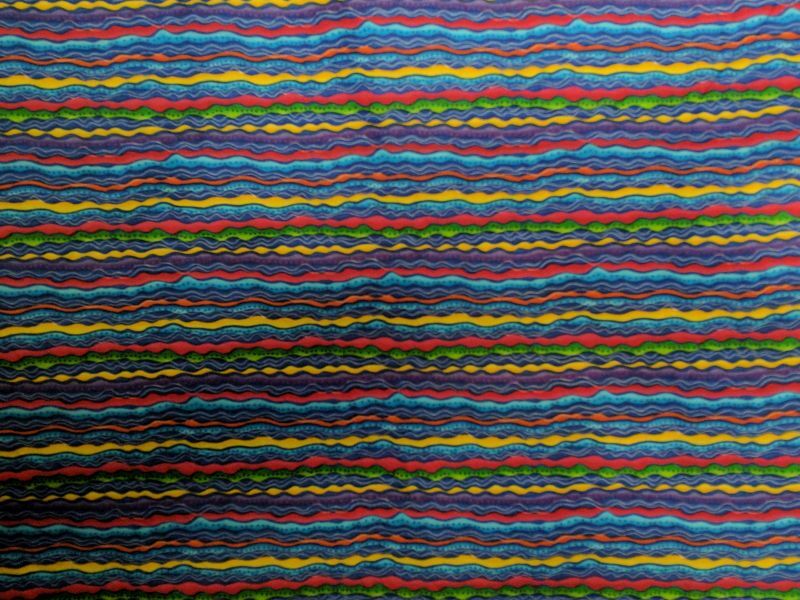 This fabric has been kicking (it’s more vivid in real life) around in my sewing room. I also unearthed a free pattern from American Patchwork & Quilting Magazine called “now and later”. Super simple quilt. I have just enough of this stripe fabric for the border. So, I’m using it for my inspiration and have pulled bright strips from my precut box. I plan on using some of the neutrals I bought on the trip to Jackson and of course pull from my stash. I want this bright and colorful. Oh — I want to make another rug. I have a stack of Kansas Troubles strips from a couple of partially used jelly rolls. If I can come up with 40 or so strips I may use those. Of course, I’m planing on quilts for the aforementioned Quilt Show. 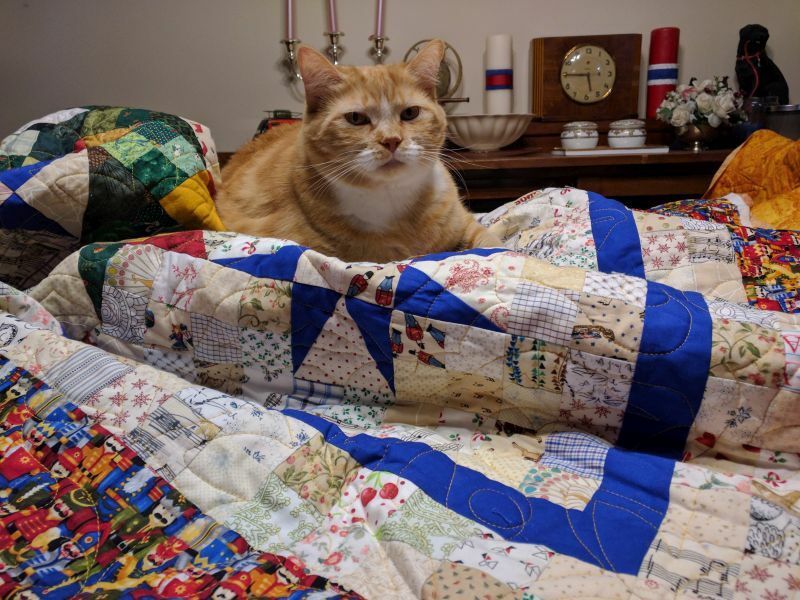 I want to finish my En Provence which is partially quilted and the hourglass quilt I’m making from vintage hand pieced hourglasses. Cascade is now sitting on my cutting table taunting me to finish it up. The only reason Carolina Chain and On Ringo Lake are not taunting me is I have them contained in project boxes. One is up on the project shelf, the other is under my sewing table. Winter Wonderland is in the living room by my chair — although I haven’t watched television in a while to need something to work on it. And didn’t I say I wanted to finish my JT2 by November 2019 and I had a plan? I haven’t done my June or July blocks! Yes, I’ve jumped on the Jelly Roll Rug bandwagon. I had been thinking about it since I saw the first class in my area — but it was at the same time as my trip to the MQA June Gathering, so naturally I didn’t sign up for it. While on the trip I bought a Benartex jelly roll at Tuesday Morning — I had heard fabric could be found there, but personally had not seen any. Of the 3 or 4 choices I picked Sevilla. I thought the yellow would go in my sewing room and the price was right. The next step was to get the pattern. My sister nabbed a pattern at the quilt show we went to in Wichita. When I bought the batting to recover my ironing board, I decided to use the leftovers for my rug — when I got that far and after I got my own pattern. But then Creative Hands was doing a class for $30 and it included the pattern and batting. Sold! Taught in one day, we started making our ‘rope’ from the center. After about 2 -2 1/2 hours we stopped and started on the rug. This is NOT the way the pattern lays out the instructions but it worked. Mine had a “peanut” shape when I brought it home. The thought was it would press out. But when I straightened it, it waved big time. So, I ripped all the way back to the first curve. I started with a seam ripper and realized quickly that was going to take forever. So, I got out the eyebrow trimmer that Alison gave me to put with my quilting notions. Click HERE to see the eyebrow trimmer at work on my rug. Once I was done ripping, I started again, this time, going around that end differently (no, I’m not sure I can explain it), resulting in a much flatter rug. I did press it once after a couple of rounds, but after that, I just sewed and the rug is flat! I ran out of thread this evening working on the new quilt. This spool of thread lasted me about 22 months 9/9/16 – 7/19/18. Yes, I made a note on the spool when I started it. But then I couldn’t find the spool I purchased in June in anticipation of this day. Crawled around on the floor under my sewing table since the cats and I are constantly knocking stuff off the table. No luck. I remembered having it when I was working on my Carolina Chain quilt in the living room, but it wasn’t in that box. I knew I could make due with another color of thread for my piecing tonight, but I needed to locate the new cone of thread for my class Saturday. 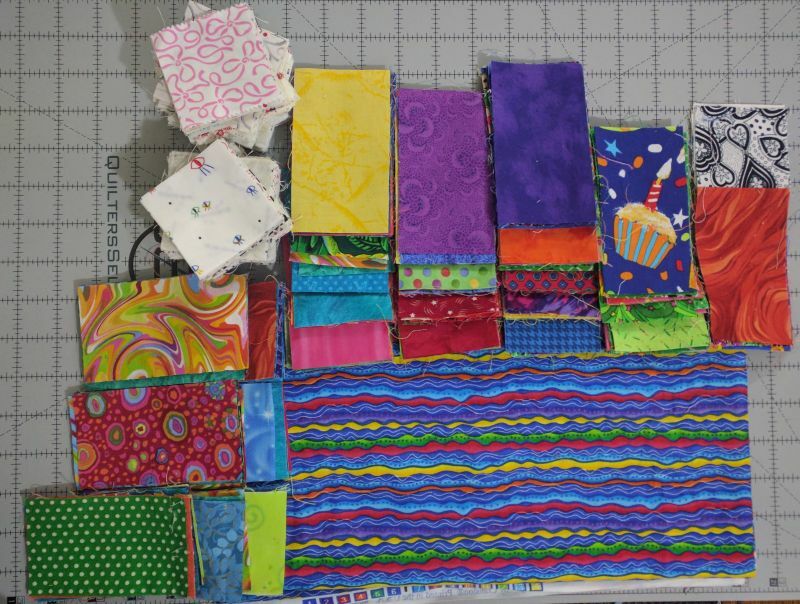 I’m going to make the Jelly Roll Quilt and I understand it takes a LOT of thread. Naturally, almost instantly after I posted on Facebook that I couldn’t find my thread I turned around and spotted it in another box I had open in the living room last month. Now I have to decide which machine I’m taking to class Saturday. My Husqvarna Quilt Designer or my Singer Genie. 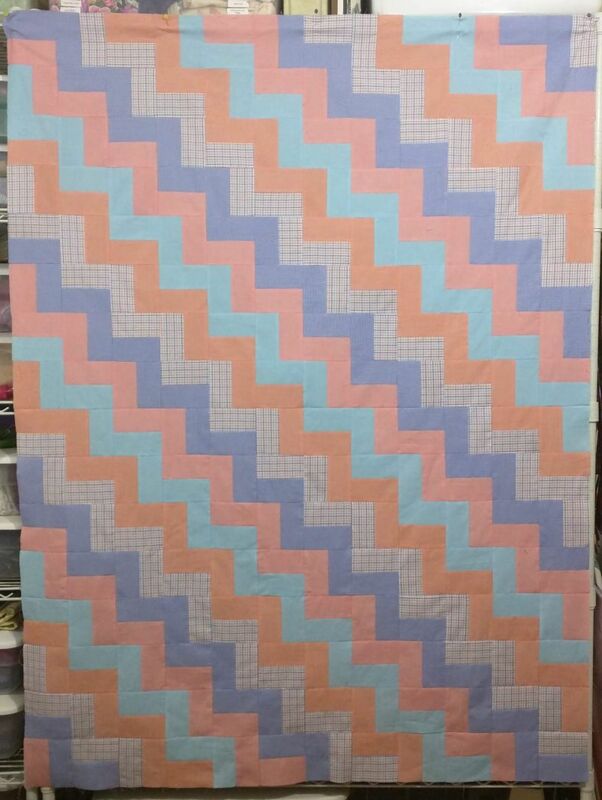 In the meantime, I moved forward on the pastel shirt quilt. This is just shy of 1/4 of the quilt. It will be 6 more rail blocks wider and 9 more rows longer — if the fabric holds out. Better lighting is needed, but this in my monochromatic table runner I pieced back in March 2016. I just finished stitching down the binding. So naturally I’ve started another quilt. These are my fabrics. It’s going to be made with 2-1/2 inch strips and finish at 56″ x 68″. I thought my limitation was the plaid, but it turns out it’s the solid colors. Those were smaller shirts. This is the current plan. Well, at least I was off work all week. Too bad it took me until Thursday afternoon to figure out how to turn off the notifications on my phone for my work email. My sister-in-law bought us all tickets for a Royal’s game. They lost, but the fireworks afterwords were awesome. I’m doing my best to turn her into a quilter. 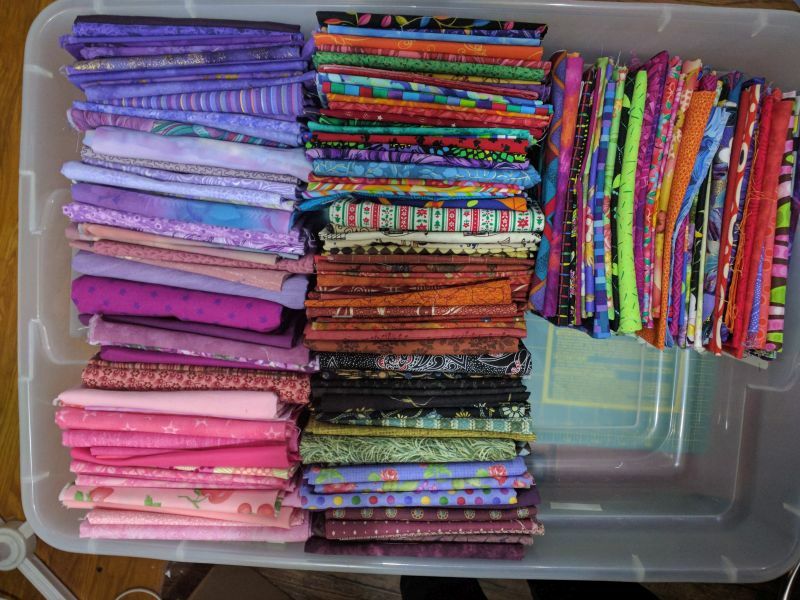 When I visited with her in June, she showed me some of the fabric she had left over from clothes she’s made over the years. 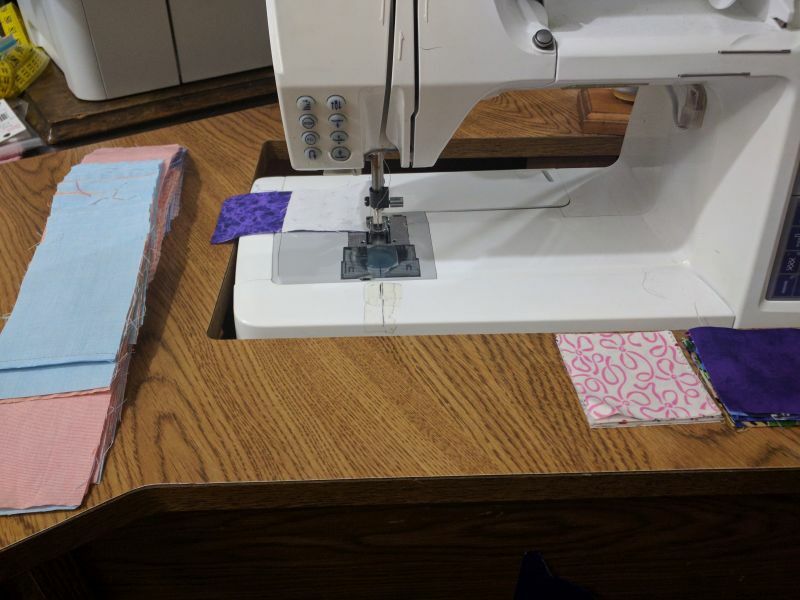 She started cutting 5 inch squares and brought them with her and then we designed a simple quilt based on the number and color of squares she had. We even found some yardage in my stash that will be a great backing. I also went through my rulers and found some duplicates which I was able to send home with her. Then we hit a couple of quilt shops. At the first one, we found the Christmas Panel. That afternoon we drove to Lawrence for lunch, so naturally we stopped in at the quilt shop there. That’s where we found the the burgandy, green, and cream to make our wall hangings. She flew home Tuesday and I stopped at a new to me quilt shop on the way back from the airport. I didn’t get anything this time, but I’ll add it to shop rotation. Wednesday, I went to an estate sale and came home with a box of ties, Christmas fabric and upholstery samples. I’ve got the fabric and samples washed and put up, but still need to wash the ties. Thursday, I decided to swing by another quilt shop. It’s probably been 5 years since I’ve been in it. They’ve doubled their space, are now selling A1 quilting machines and have WAY more fabric than they did on my first visit. Best of all, I think I’ve found a purse/bag pattern similar to the bag I was carrying so I don’t have to figure out how to make it — just follow the instructions. Finally today I started out at a garage sale where I picked up a couple of patterns, a piece of striped fabric and a new to me printer. Then on the way home we stopped by the book store and I picked up a quilt book on different log cabin quilts. I’ve also quilted on my monochromatic table runner. I’ve been working on the binding the past couple of nights and should have it done in one more evening. Tomorrow if it’s not too hot when I get up I’ll go to a quilt show. After that, it will be gearing up to go back to work. Tonight I finished a quilt. That’s a total of 2 quilts for the year and two more than I finished last year, or the year before combined. It still needs to be washed, but it’s bound. 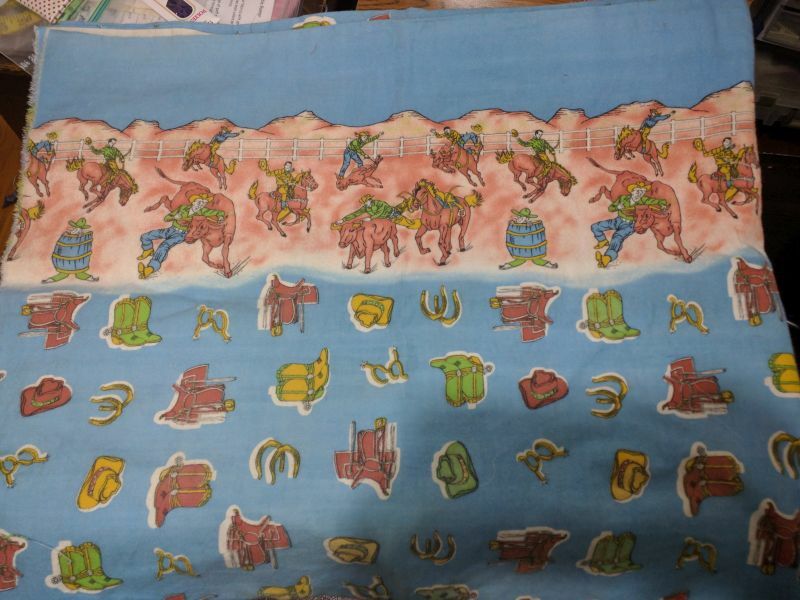 The top fabric, except for the border, came from a box of scraps that a friend gave me several years ago. The border fabric is from the early 1990’s and my mom’s stash. The backing fabric came from my stash — I think I bought it around the time I was making the Eeyore quilt. Simple cross-hatching, measured by wide painters tape. The quilt measures 39″ square before washing. I’ll do that in the next few days. I have a very large room that I use for my sewing room and office (I work from home). It’s about 17-1/2 feet long and nearly 13 feet wide. It should be plenty big for anything I need to do. However, if you notice on the drawing which is nearly to scale there is a large window on the west wall, a door into the garage, a passage into the kitchen, a door into the living room (I keep the swing door propped open except when I know guests are coming over) and a fireplace. Additionally there are 2 AC vents and a return all about 6 – 8″ off the floor. I’m getting my front window replaced next month and have to pull everything away from the window. Since everything will be disarrayed, I thought I’d take the opportunity to clean up and rearrange. This is the current layout (each square is 6″). At one point I was able to have 4 friends over to sew. The last time we got together we took over the living room and dining room as over the years I’ve brought more ‘stuff’ into the sewing room. Currently, on my sewing table I have a printer on the window end and my sewing machine on the other end. There is also a printer on the end of the work table/desk over the file cabinet. One scans and faxes but doesn’t print, the other prints but doesn’t scan or fax — and I use all 3 functions. As part of this process I’m planning on getting down to just one printer. The wire shelves along the west wall is the result of “stuff”. I really think much of the stuff can be gotten rid of or belongs somewhere else in the house. I want at least 2 of those gone. The ironing station is a large dresser with 3 drawers. That space is not being utilized well – partly because the drawers don’t slide well. I’ll either replace the dresser or get drawer slides — but I’m not giving up my large ironing board. The fabric shelves on the west/kitchen wall will be staying. My preference is to keep them together so I can hang tops from them. The cutting board is one of those fold down boards. I don’t want to get rid of it, but truthfully it is frequently just a flat surface. I can cut on my ironing board. There are two desks in my office because I have a personal computer and a work computer. At one point I had 3 monitors so I needed the space. I now just have 2 large monitors and they both will fit on the “desk with shelves” – I just have to get rid of the file cabinet currently under the desk. I think that’s doable. So, I think this is what I’m looking at for the new layout. The plan is to put a single printer on the shelves over my desk. The smaller file cabinet will hold up the work desk which will become my new sewing table. The other end is held up by wire shelves which will now be accessible. The only thing this layout doesn’t have is a 3rd set of wire shelves. I suppose I could put it folded in against the sewing table in the middle of the room with a set of wire shelves on the west wall next to the fireplace. Of course in order to remove storage from the room, I’ll need to be ruthless in what I keep. 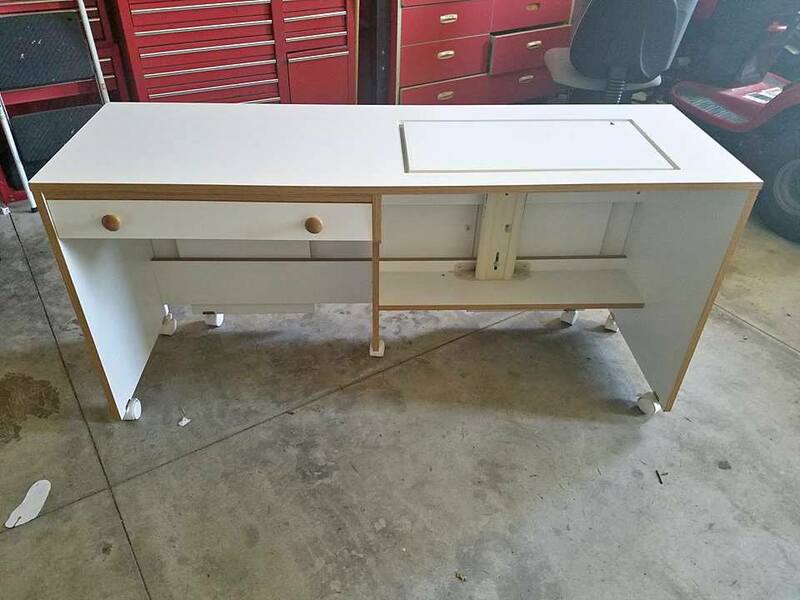 I currently have a couple of under utilized rolling carts with drawers under my sewing table which are not shown and there is a small set of plastic shelves sitting on top of the cutting table, but as I look at what is on those shelves I have to wonder if they are really necessary. If I have a shelf or flat surface, it just gets filled up as I get lazy putting stuff away. If you have a suggestion, chime in. I have no budget, except maybe for a new printer and I hope to get the all-in-one working without having to buy a new one.